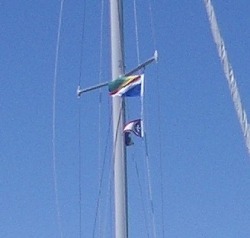 The family flag or owners flag is flown from the starboard spreader, taking deference to a national courtesy flag but prevalence over the club flag (assuming the latter cannot be flown from the top of the mast where it ought to be but normally cannot be because of the windvane, antenas and other electronics). This flag is only flown when at anchor or moored, or as a racing flag: flown from the top of the mast, though we fly it from top of the mizzen on a pig stick to avoid it getting tangled. The only "entity" one is racing for is the owner, flying the national ensign or the club pennant would indicate erroneously that one sails for and on behalf of the country or the club. If at the starboard spreader it indicates that the owner is on board and willing to entertain guests. If hoisted with a small blue pennant it means that the owner is away (find him in the bar of the club house) and if a small white pennant is flown it means that the owner is dining (it is basically a "don't disturb sign" and dining should be interpreted widely). A white pennant flown from the port spreader means that everyone is on board but the crew is busy so visiting would not be appreciated. Flying the blue and the white pennants may be a bit antique and from the time when the paid crew would sail and the owner and family would just enjoy; the other traditions have a rich history and show the difference between yachting and boating. But why does the Van Hasselt-Eischen family have all these colors?